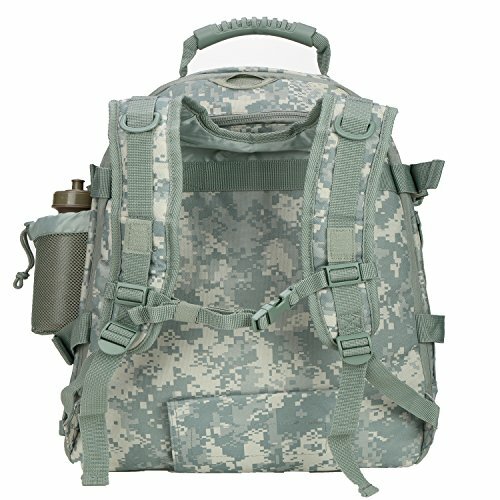 This pack is a great companion military sport, camping, hiking, overnight trip and weekend getaway. The capacity is can be adjust, 39L fit to daily and you go to travel with 64L. 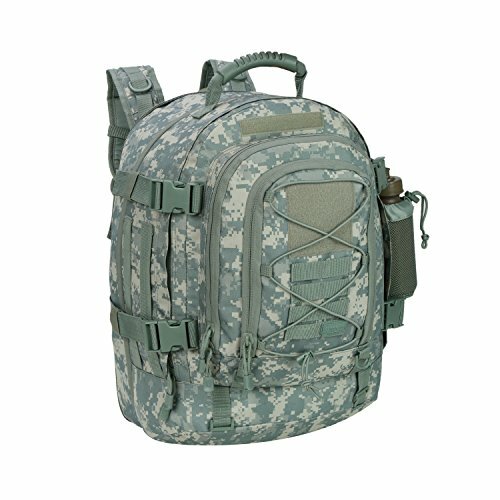 Front Compartment : Mobile phones, pens, books, namecard, first aid kit, batteries, chargers, keys, wallets, watches, etc. Middle Compartment : Ipad, tablet, laptop, books, documents, earphone, etc. Main Compartment : clothing, tent, big laptop computer, earphone, towels, blankets, etc. # There is a hidden zipper on the side that opens to free up more space, from 39L to 64L. # Daisy chain holds rain gear, etc. 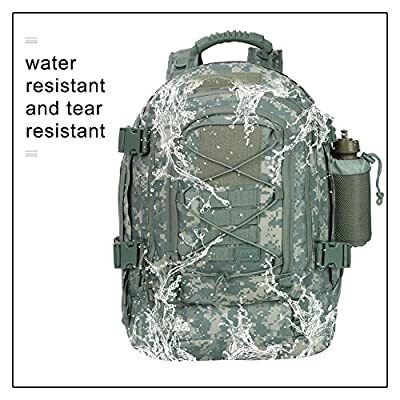 EXPANDABLE&DURABLE MATERIAL:Capacity expands from 39 liters (2380 cu in) to 64 liters (3905 cu in),Expandable Size:15" x 21" x 13" (W*H*D),Water resistant and tear resistant. 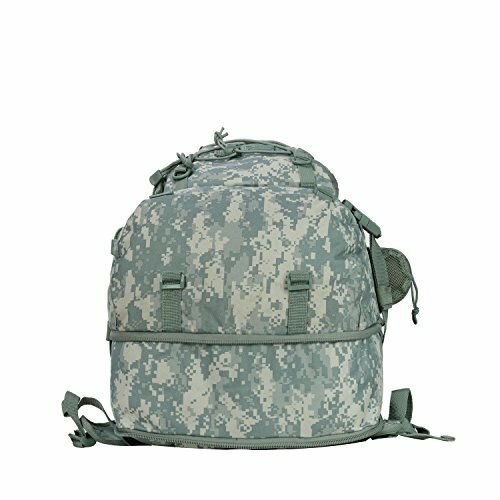 STRUCTURE: 3 exterior zipper pockets;Water bottle mesh pocket,mountaineering hook easy to climb and molle compatibility that allows customizing the pack for your needs.It is made of heavy-duty 600d polyester material. 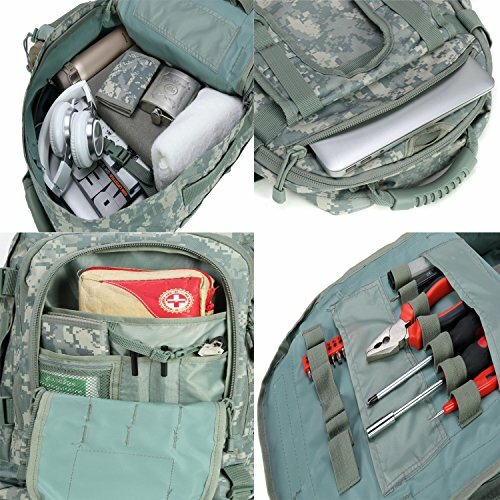 MULTIPLE COMPARTMENTS?It has a laptop pouch (17" x 11.5") directly behind the back padding?inside can collecting earphone ,first aid kit,or screwdrivers tool etc. 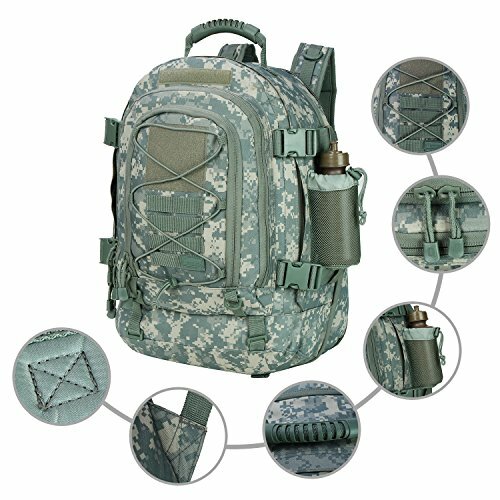 COMFY&STURDY?Comfortable padding back area, Ventilated mesh padding shoulder strap?adjustable sternum strap,back of tactical bag small pouch can be put for Walkie talkie. SUITABLE AND 100% Satisfaction Guaranteed:Expandable Tactical backpacl can be used as 3 day military outdoor sport , hunting ,survival ,a long hike, an overnight trip, or a weekend getaway,Our Promise-100% satisfaction ,If your friends like outdoor activities, this expandable tactical package is preferred.Bring your friends to joy and surprise.